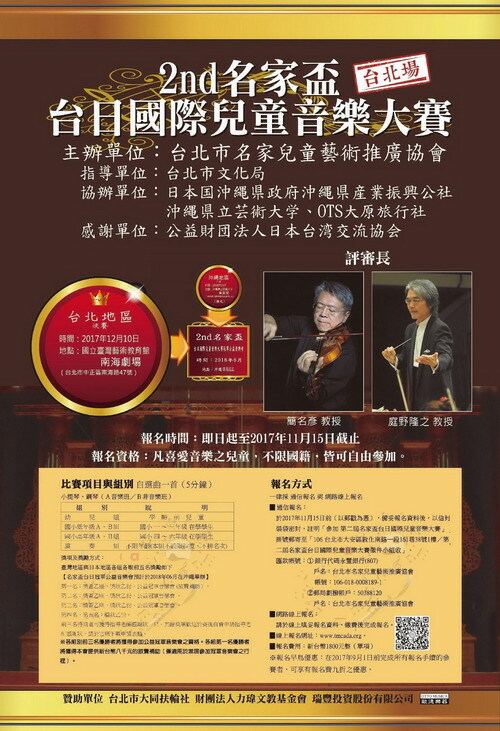 The aim of the â€œ2nd Maestro International Childrenâ€™s Music Competitionâ€� is to broaden childrenâ€™s horizons and improve their ability in the arts at international competitions like this; thus the organizer has especially invited Professor Jian Ming-Yan of the Taipei National University of the Arts to hold competitions in Taiwan and Japan and invites winners to perform in the â€œCharity Concert by Taiwan â€“ Japan Championsâ€�. We welcome children from all over the world who are learning music to come and take part in this special event. Focusï¼šA new platform for children all over world to exchange opinions and learn from each other through music; from the competition to the music concert, leaping to the world from Taiwan, the latent ability of young musicians of Taiwan will be brought to fruition.